With the upcoming (Jan. 11) release of the all-star-cast film Gangster Squad, I spoke with author Paul Lieberman about the movie and his true-life book that inspired it. Paul had shared the stories and his research a couple of years ago when they first appeared in The Los Angeles Times, where he then was its New York-based culture writer. Paul also wrote the introduction to my book, Reflections. 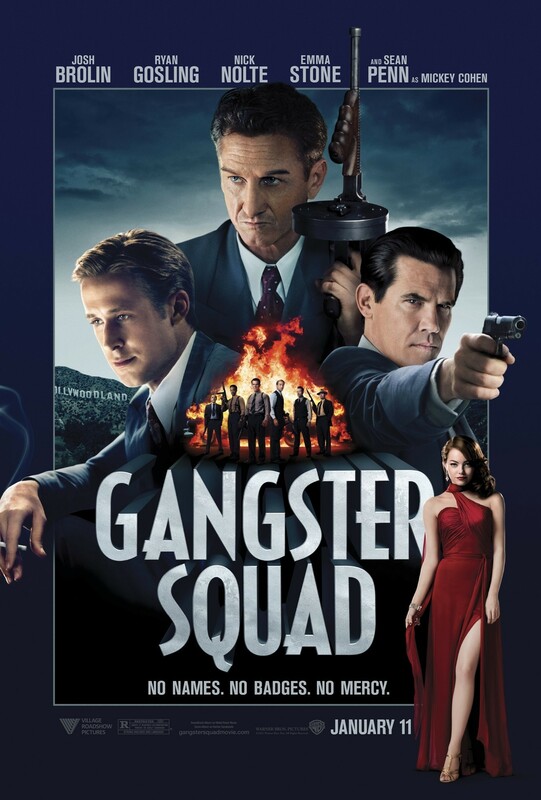 Q: Before I talk about the book version of Gangster Squad can you share with us some inside information from the set especially the Ryan Gosling-Emma Stone story? A: Can Sean Penn be part of it? Q: Of course, he plays Mickey Cohen, the showboating mobster who was a headline machine in Los Angeles from WWII through the 1950s. Q: Is that the scene in the trailer in which we see Emma in an alluring red dress at the bar asking Ryan if he intends to take her away from the evil life and his deadpan answer indicates other intentions? A: It always pays to laugh at the big guy’s jokes. Q: Judging by the trailer, the film seems to be a blend of the old Warner Bros. gangster epics and a modern action movie, meaning the hero (Ryan) gets the girl and the good guys prevail. But your book, which tells the real story of the secretive LAPD squad that battled the mob, is darker. It’s classic Noir, a chilling tale from the era that still defines L.A.
A: As I put it in the book, that was a time when truth wasn’t found in the sunshine, and justice not found in a marble courthouse. These cops meted out justice at night up on Mulholland Drive, where Sgt. Jack O’Mara would put a gun to the hoodlums’ ears. Then on Sunday, he was head usher at his church. He’s played by Josh Brolin in the film. Q: You suggest that Mickey Cohen was a perfect match for Los Angeles as a mobster. Why? A: Both were obsessed with image. City fathers were determined that their sun-washed paradise not go the way of the cesspool cities back east, like New York and Chicago, where the mob was so powerful. That was the impetus for the LAPD to form the Gangster Squad in 1946. One crime report actually had a section headlined, “The Invasion of Undesirables.” Mickey meanwhile was obsessed with building his image as a big-time gangster. He posed at home for “Life” magazine, showing off his shoe closet and the bed custom made for his dog “Tuffy.” Today Mickey would have his own reality TV show, no question. Q. The film says it was “inspired by” the true story. Is that an acknowledgement that a lot is fictionalized? A: Short answer, yes. The real O’Mara slept with a Tommy gun under his bed and Mickey Cohen complained that the cop played by Gosling, Sgt. Jerry Wooters, was trying to kill him. But those real cops didn’t have wild shootouts with Mickey’s crew. That’s the stuff of a Hollywood gangster films. This one is set in 1949, the year Warner Bros. released one of the classics, White Heat, which was loosely inspired by the real Ma Barker gang. Its famous ending has Jimmy Cagney atop an exploding oil refinery shouting “Made it, ma! Top of the world!” Of course, no gangster blew up like that in real life. That’s cinematic invention. Q. Which also explains the boy-meets-girl storyline, which brings us back to Mr. Gosling, Hollywood’s current heartthrob. Was the character he plays really a ladies’ man? A: He was. The real Jerry Wooters was shot down over the Pacific during WWII and kept all these photos of himself making time with lovely nurses. Later he married a stewardess and had two sons, both of whom came to the set. They were taken aback when Ryan, playing their dad, ordered a Nehi soda in one scene. The character had started out drinking hard stuff but Ryan wanted to show him becoming more committed to the squad’s mission. The real sons laughed at the touch, though. “The old man never drank soda pop in his life,” one said. Indeed, the real Wooters boasted in old age that he used every penny of his police pension on booze. He had a house on the beach in Newport and spent his last years drinking with his buddies on the back patio while watching the California babes pass in their bikinis. Q: Speaking of Ryan Gosling and Emma Stone, we also see a cute bulldog in the film’s trailer, frolicking with the glamorous couple. Is there a back story behind the dog? A: That’s Mickey Cohen’s beloved bulldog,” Mickey Jr.” He came after the fluffy terrier “Tuffy” and went everywhere with the human Mickey. He even got kidnapped once — alas, the dog-napping is an episode in the book version of “Gangster Squad” that never made the film.